Business Bible Verses Every Christian Entrepreneur Should Know - Christian Business Revolution Before we jump into the Bible verses for business I want to make one thing clear. These Bible verses are meant to be taken in context. That means, they must be read within the Bible in the middle of the text where it is included. Taking a Bible verse out of the Bible can mean something entirely different. That can be dangerous. The Bible is God’s revelation of Himself to mankind. Each word is meant to transform your life so that you can reveal Christ to others. When you are changed from the inside out, people will notice. Your life will become a light to those who are living in a dark, dark world. Let’s get on to the verses before I start preaching . . . hallelujah! 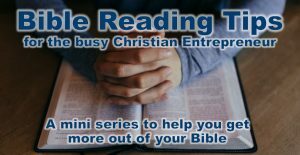 What type of Bible should Christian Business Owners Read? Before we jump into the Bible verses for business I want to make one thing clear. These Bible verses are meant to be taken in context. That means, they must be read within the Bible in the middle of the text where it is included. Taking a Bible verse out of the Bible can mean something entirely different. That can be dangerous. The Bible is God’s revelation of Himself to mankind. Each word is meant to transform your life so that you can reveal Christ to others. When you are changed from the inside out, people will notice. Your life will become a light to those who are living in a dark, dark world. Let’s get on to the verses before I start preaching . . . hallelujah! Note: Clicking on the verse will take you to Bible Gateway where you can read the verse in multiple translations. Find the one that resonates with you and commit it to memory. You can also select the passage and read it in context. Remember, the Bible isn’t only about growing your business. It is about growing your faith. Read your Bible to grow who you are. When you grow, it allows your business to grow. The best idea you can search for in your business is to understand God’s will. His will is that you lead others to Him. As a Christian business owner, you should be able to lead someone to Christ. You can have all the Bible knowledge you want, but if you don’t know how to lead someone to Christ you are missing the point. That is why our last few verses can be used to lead someone to know Christ. It’s not just about reading Bible; it’s about salvation! Your salvation and the salvation of those whom you influence.